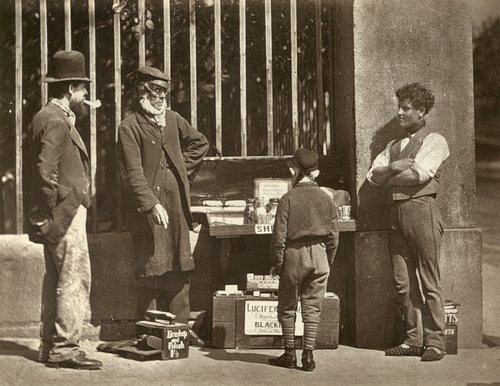 "Jacobus Parker, Dramatic Reader, Shoe-Black, and Peddler, is represented in the accompanying photograph standing at his accustomed pitch. Although the career of Parker has been clouded, and his life-story is one of struggle and disappointment, yet he has fought the battle bravely, and, as a veteran, is not without his scars. "There is one thing I am proud of," said Parker, one day; "I am near three-score years and ten, have fought life's battle and won, and will carry with me to the end its chief prizes-a hale heart and a contented mind." "Greed of gain, sir, has never been my motto. It is but a poor object to fill up every nook and cranny of a human heart from boyhood to old age, as it does with many." Again, in his own words, "I have always advocated temperance and detested drunkenness. In my youth I never did apply hot and rebellious liquor to my blood, nor did, with unbashful forehead, woo the means of weakness and debility.' Ah, sir, I have seen wine make woeful wrecks of men and women too, recalling the powerful lines, ‘Oh! thou invisible spirit of drink, if thou hast no other name to go by, let us call thee Devil.''"